SF Taxi Media: When It Comes To Transportation Oracle Likes Private Charter Buses And Pedi-Cabs, But Maybe Not Taxis. By John Han. 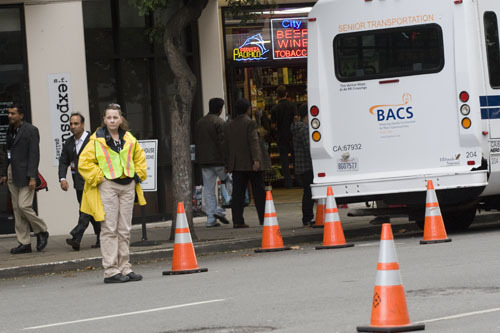 When It Comes To Transportation Oracle Likes Private Charter Buses And Pedi-Cabs, But Maybe Not Taxis. By John Han. Oracle 2011 at the Moscone Center in San Francisco. 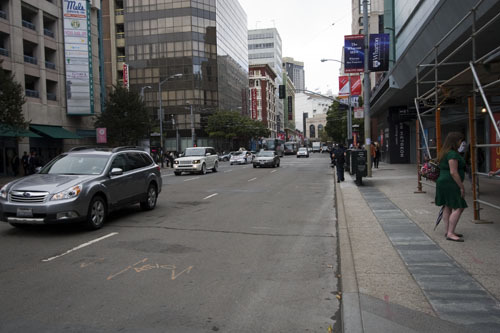 Oracle, the database management software company that brings over 40,000 extra people to San Francisco once a year, flooding hotels, restaurants, and clubs to capacity, may not think very much of cab drivers. 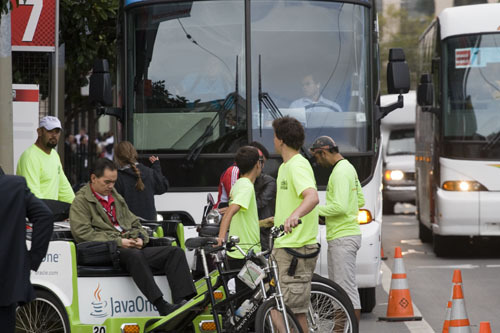 The company hired private charter buses and pedi-cabs to provide exclusive curbside service to its tens of thousands of attendees. That's understandable. 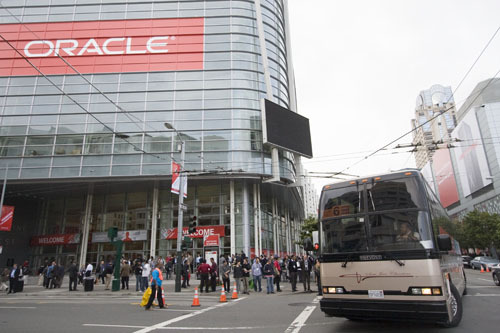 Oracle is easily the largest convention in San Francisco all year, bringing business to lots of people, and its attendees are going to have to get top notch service to and from the convention, hotels, and restaurants. But taxi drivers, it would seem, must step aside when there's something important going on in the City, like Oracle. Cabs were excluded from providing curbside service at the convention, the taxi access being moved away to the area's outskirts. 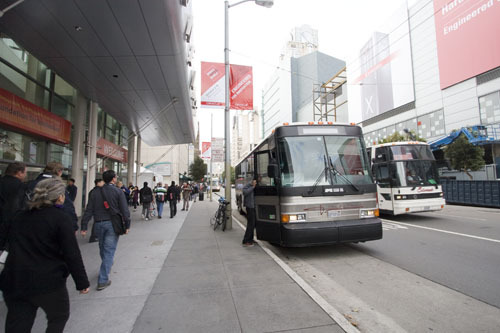 Oracle hired charter buses to provide curbside service on Fourth St. in front of the Moscone West. to a more desolate area in the outskirts. pedi-cabs get curb side access for the convention. Taxis weren't technically excluded from servicing the Oracle convention. There were two temporary taxi stands moved to the out skirt areas of the convention. Look at this one. This is one of the temporary stand is on Fourth St. between Mission and Howard St.
of the Moscone Center. A man hired by Oracle to coordinate the charter buses told me that conventioneers weren't bothering to use the taxi stand. He said he was telling conventioneers to walk up to Market St. if they wanted to hail a taxi. pick ups and drop offs, as they are not allowed to service the immediate area. 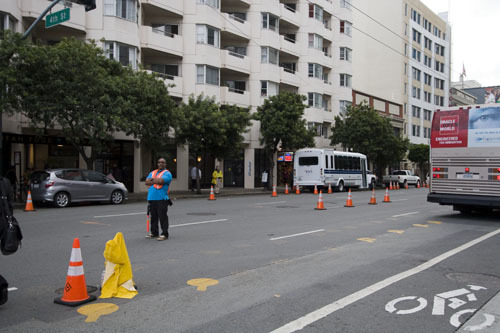 These traffic enforcers prevent anyone from stopping in front of the Moscone West on westbound Howard St., just after the intersection of Fourth St, including taxicabs. 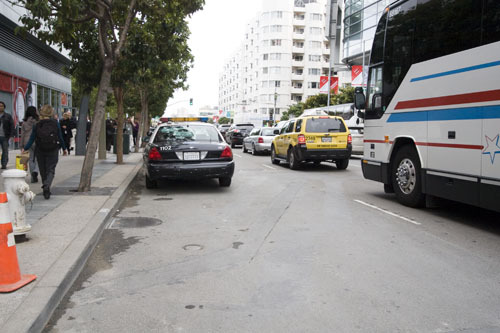 This situation at the Moscone West is similar to situations at AT&T Park, when taxi drivers try to pick up after ball games, or in front of the Ferry Building where taxi drivers have been severely ticketed in that past for servicing the area. Traffic enforcers should assist people in getting taxis as this would aid in the transit first policy. Instead, traffic enforcement often discourages taxi use by punishing drivers attempting to work the area. 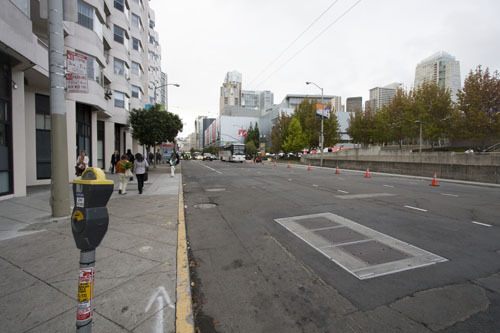 The north side curb of Howard St. @ Fourth St. immediately in front of the Moscone West's main entranceis restricted from any normal traffic, including taxi drivers hoping to service the area. The empty lane here is the east side lane of Fourth St across from the Moscone West. There were no cars using this lane during the tine I was photographing. I don't know the traffic arrangements made between the City and Oracle, or between Oracle and the private charter bus and pedi-cab companies, but it would seem that this curb could've been used as a large, temporary taxi stand for the convention. This is the same lane from a south facing view. Police cars are parked along the east curb of Fourth St. across from Moscone West. There are more police cars parked in front of this one, you just can't see them from the photo. But if police cars can park here, why couldn't taxis stop temporarily to service conventioneers? There is plenty of foot traffic here from the convention and would be a good place for a large, temporary taxi stand. 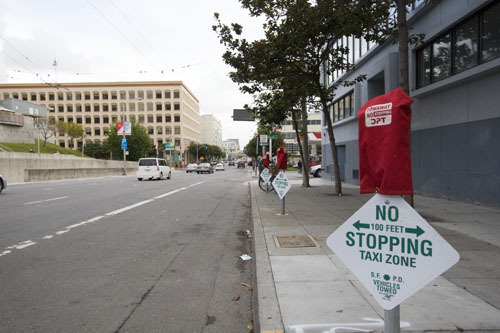 But it speaks to the issue that if San Francisco wants better cab service then it has to do more than just think about adding more cabs, and do its part to make existing cab service more available, and that includes access to major events like Oracle. 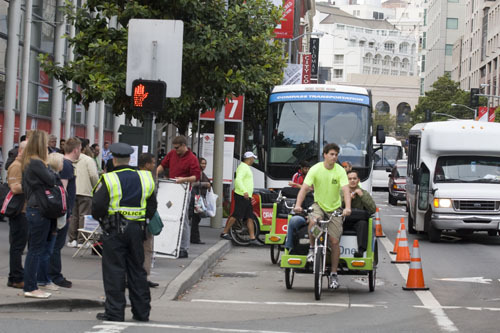 And that idea about access to major events should carry over to more continuous events in San Francisco like ball games at AT&T Park, where drivers are often harassed and ticketed for trying to service that area. visitor to the convention and taxi are forced out. 4th street between Howard and Folsom. This is a good privilege for employees. Oracle takes care of its employees well so they can be productive.